The Days of Johann, an agility dog! : Don't forget to watch Oprah today - it's too important to miss! Don't forget to watch Oprah today - it's too important to miss! Just about an hour, here in EST, before Oprah does her show investigating puppy mills. Be sure and watch, tell everyone you know to watch, spread the word - this report is too important to miss. 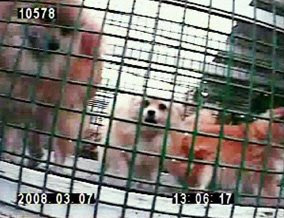 Visit Oprah's website for more information on Lisa Ling's investigation into puppy mills by clicking here. We also encourage you to send her an email, and thank her for bringing this important topic to her millions of viewers. This may be the widest audience ever to be reached with this issue - just think what an impact it could have. Oh I don't think I could watch it.. I'm glad she's doing it but I really don't think I could watch it. Can't bear to actually watch it, but I'm glad Oprah's publicizing those horrible businesses! We watched it, Mum burst out crying on a part of the show...we are also really glad that she is showcasing such an important issue. We think overall she did a great job! Hey Johann, we haven't posted a comment in a while, but just thought we'd see how everything was going. We recorded the Oprah show and will watch it later today. Sounds like it's going to be heartbreaking. Maybe we'll have to watch it alone so no one see's us crying. I saw the commercial for this then forgot to watch! i wonder if it's online somewhere. It's just SO good to get the word out about how horrible puppy mills are! Mom is furious that she missed it! Hopefully, we can catch it in the reruns!